Most modern road bikes now come with some form of fuel injection system. Some systems are as advanced as having dual stage sequential 12 hole injectors, 32 bit processors, and multiple on-board 3D maps. The performance, emissions, and economy advantages of these fuel injection systems are staggering compared to what was possible using even the best carburetors in the past. This is especially a boon for users that fit turbo or supercharging equipment to their bikes. To understand more how the ECU controls fuel and spark, THIS Toyota literature should help. Tuners looking for aftermarket carburetor parts should consult Keihin or Mikuni for exact part numbers. Factory Pro can provide beautiful high tolerance aftermarket needles and jets for almost any application. The greatest problem that any performance minded rider will face is getting the proper map into the ECU for their equipment and performance needs. Even with a completely stock bike, the map will need modification to take into account the desire for maximum performance over maximizing fuel economy or minimizing emissions (3 different locations on the fuel:air ratio curve) and to compensate for local gasoline quality, grade, and freshness. This concept holds true for the need to re-jet stock carbureted bikes as well. The best way to optimize the map would be for the manufactures to equip the bike with a programmable ECU and to re-map the bike on a brake dynamometer. I believe that we do not see programmable ECU's on stock bikes (Suzuki ?!?) because most governing agencies do not allow for vehicle emissions to be tampered with, of which the fuel system is now part of. If this is the case, it is surprising that the manufactures do not make it easier for the aftermarket to produce low priced replacement ECU's for 'off road' applications. Keihin, Denso, and Bosch are major producers of OEM ECU's. Honda HRC does supply a programmable ECU with their race bike kits, but they require the installation of a racing wire harness as well. This does not help the average street rider. (Thousand Oaks Honda is the US distributor of HRC parts). Yamaha Engineering Corporation provides a similar product for it's race bikes. Suzuki GSX-R's have ECU's that can be re-programmed, somehow bypassing EPA ban on tampering with emission control systems. Factory makes a tool called Teka that will accomplish this task. Also, Yoshimura makes a tool for remaping the stock ECU named Yoshimura R&D Advanced Fuel Management Systems (YAFMS, or Yosh-Box). Real world (non-GSX-R) riders are far from the position of needing either of these options and are forced to run piggyback systems. The piggyback system keeps all of the stock ECU parts and wiring in place, but interrupts the send line to the injectors, modifies the signal, and sends the new signal along. The Dynojet Powercommander line is the most popular example of this system. The cost is less than $350 for the most expensive units and they jump right into the stock wiring harness. Some of these units will modify the ignition timing as well. The drawback to this system is that it functions primarily by "fooling" the ECM by modifying the engine temperature signal, sending a cool signal to richen the mixture or a hot signal to lean the mixture. The ECM however uses many other inputs to calculate the exact mixture to send. This can lead to poor fuel ratio's given certain conditions. In the case of models that modify the ignition timing, the rotor pulse is modified before reaching the ECM to advance or retard the timing. Other than "scatter" generated at high rpm, the main disadvantage here is that the ECM uses that pulse to time the fuel injectors to the valves and piston. At worst, this leads to poor fuel atomization and reduced power. Yoshimira also makes a similar device to the Powercommander called EMS. The maps for either system can be exchanged. Dynojet also has a Widebandcommander available to continually monitoring air-fuel ratios for detailed tuning info. These units cost $530. One very cool feature hidden within some bike builds is the ability to ground one or two lines going to the ECU and thus render the stock unit partially programmable via the CO Adjustment Mode. The fuel injected Yamaha R6, R1, and FJ1300 all have a feature like this. For the R6, by grounding "line 29" (and line 27 if needed) going to the ECU, the computer is driven into a programing mode very similar to as if the race kit wire harness has been installed and will allow limited programming to the fuel and ignition curves. The difference between the kit computer and this programing mode is that the program mode adjusts the map for each cylinder by a simple vertical shift, the kit computer adjusts based on throttle position. Ochlocracy describes this for R6 in THIS message board post. It is also described for R1 in THIS post. You can see the exact reprogramming procedure for R6 on pages 24-28 of the factory race kit manual HERE. Obviously, Yamaha owners, it pays to get the race kit manual. For the serious do-it-yourselfers, a project exists that allows you to build your own fuel injection system. It is called MegaSquirt by Bowling & Grippo. For less than $200 you can build your own EFI controller. You then must tie it in or create the rest of the FI system. If you love to tinker, this may be for you. For optimum tuning of a fuel injection system, the injectors should be matched so that the amount of fuel dispensed per pulse does not deviate by more than 1%-2%. This gives the tuner a higher quality detail from which to map the system. Aftermarket fuel injectors are available for highly modified engines as well. Major changes in engine displacement, cam lift and duration, or the addition of a turbo or supercharging system will require this. Robert Bosch, Keihin and Denso are OEM providers of injectors and any replacement will be fine provided they can supply the appropriate flow at an acceptable duty cycle. RC Engineering is a prime supplier of aftermarket matched fuel injectors. Fuel injectors can be compared on a table HERE. They can also be ordered HERE. People that know nothing about tuning a bike will tell you that you only need to rejet or remap if you change exhaust pipes or make serious mod's. That is flat out wrong. All stock bikes need to be re-jetted or mapped. Bikes are designed with fuel systems that are compromised so that they can pass noise, emissions, and economy standards around the world. This, not to mention all of the different gasoline formulas available. Performance is usually the last consideration of the factory. Performance is my first consideration. 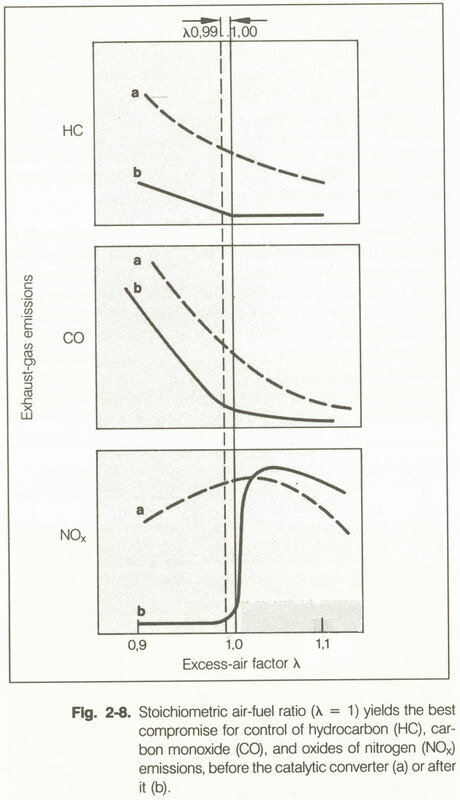 The following diagrams are from the book; Bosch Fuel Injection & Engine Management (Probst, 1991). 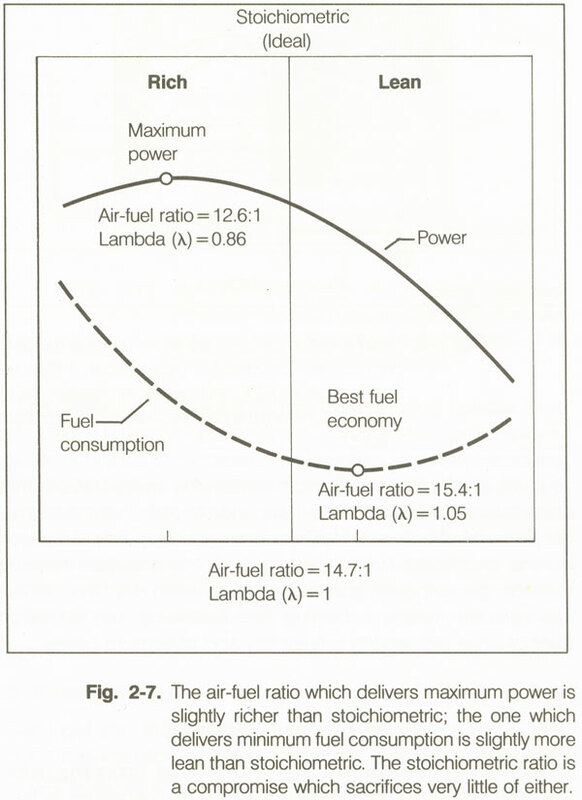 They clearly show that any manufacturer is going to build a system that provides a lean mixture for fuel economy, or just slightly rich for minumum emissions, but far from the rich mixture neccessary for maximum power. Exhaust, intake, and other power enhancing modifications usually contribute to an even leaner mixture. The system must be corrected. Usually, on high performance machines the lean conditions programed into the EMS are most pronounced a between 0 and 20 percent throttle opening and in lower rpm's. Goverment test procedures usually point to where the mixture will get leanest. Since the tests are rarely conducted at WOT and near redline, the system is probably running best in that range.